ETI Looks to the Future. Submitted 5 Grants: Secured 3 (so far with hope for more). Grants were submitted to USAID (ASHA), Rotary, Google Adwords, the Oswald Family Foundation and the Mortenson Family Foundation. ETI received funds from Google, Mortenson and Oswald and is waiting to hear about the other grants. Granting initiatives will expand in 2016. Completed Water Needs Assessment. ETI, Inventoris, KAD, MSAADA Architects, and Powering Potential met in Karagwe to assess needs and design a water-harvesting system that will collect, store, treat, distribute and re-use water. Granted Funds to KAD (TZ) to Construct 4 (200,000 liter) Water Tanks. The tanks will collect water from the bi-modal rainfalls expected in Fall, 2015 and Spring, 2016. 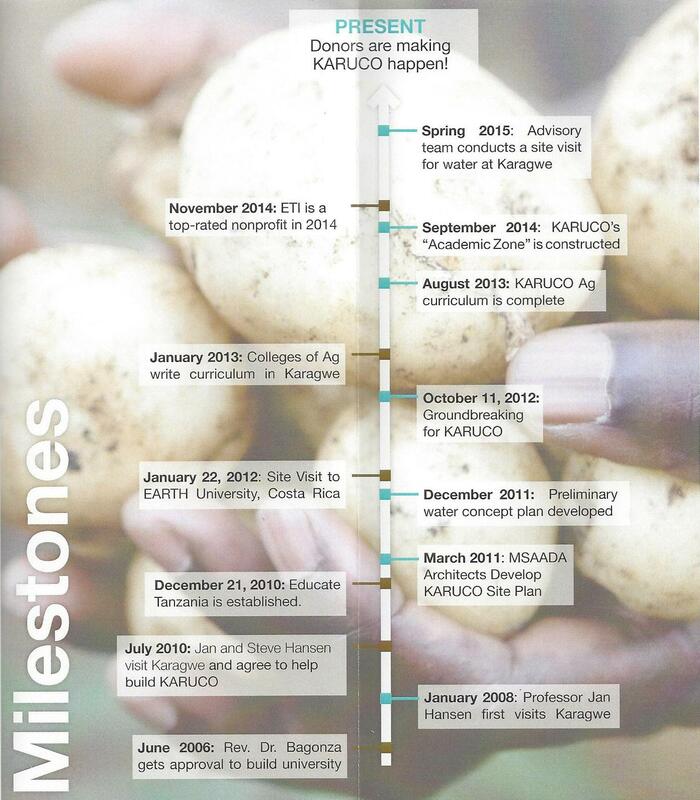 Water will enable KARUCO to open in October, 2016. Future plans include water resource managers in Karagwe who are exploring drilling options. Designed a Longitudinal Impact Study with Learning Partners (Dr. Johnstone, UMN, who will carry it out). A site visit is planned for November, 2015 and data will begin to be collected in January, 2016. 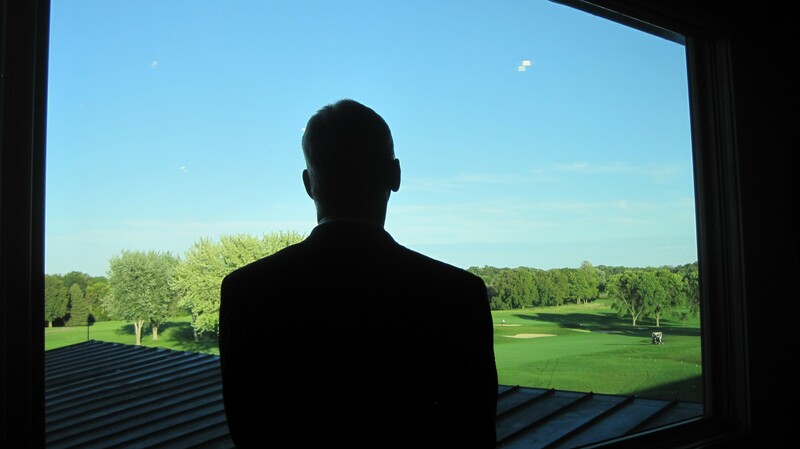 Hosted 3 Successful Funding Events: Donors are making KARUCO happen through the Give to the Max Day; the End-of-Year Giving Campaign; and the ETI Annual Dinner/Fundraiser held at Hazeltine each year. Grants, cash and in-kind donations top over $1M for the five years ETI has been in operation. (above) Some ETI Board and Officers discuss the “Learning Partner” component of KARUCO with UMN’s Dr. Chris Johnstone. Chris and ETI are working together to collect baseline data prior to the opening of KARUCO in 2016. This will set the stage to assess impact of KARUCO on 1) livlihood; 2) gender equity; and 3) environmental sustainability. (above) Board member, Barbara Hahn and ETI Officer, Lori Duzan listen as Board member, Dr. Gracious Msuya explains how ETI can maintain its high standards as evidenced through Great Nonprofits. Currently, ETI holds a 5-star rating with Great Nonprofits and is one of the top 4% of nonprofits according to the Charity Review Council. ETI welcomes its newest Board Members, Mr. Christopher Jones (Principal, Inventoris) and Mr. Andrew Peterson (Anchor Bank). Christopher has been involved with ETI since its inception and helped spearhead the water harvest design and funding. Andrew has been a supporter of ETI for several years. ETI is excited to have Christopher and Andrew and their fresh energy, insight and wisdom. Karibu sana! ETI welcomes the chance to celebrate its many achievements and refine its goals for the future. Join us and be part of the story!